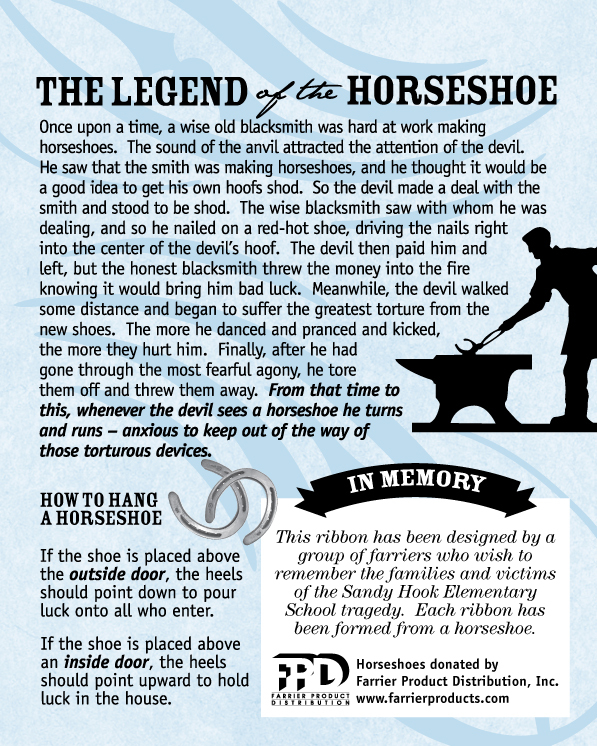 Recently, we received a phone call from Steve Storms of Montague Blacksmith Supply in New York asking if FPD would donate horseshoes to a group of farriers from Newtown, Connecticut. Led by farrier Joe Santos, the group planned to shape the shoes into ribbons, paint them green and white and sell them at a fundraiser benefiting the memorial for the victims of the Sandy Hook tragedy. 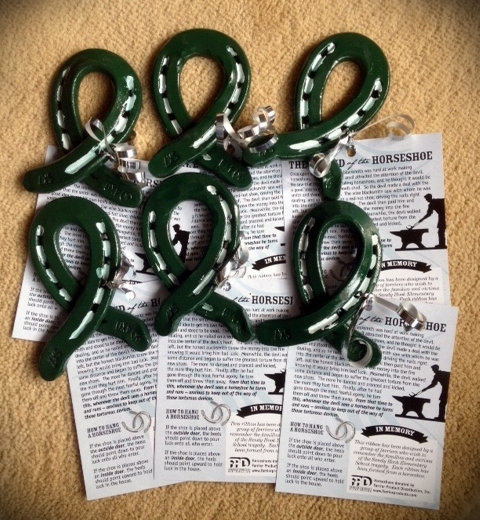 We were happy to participate by providing the Kerckhaert SX-7 horseshoes. The group of farriers working with Joe Santos on the project included John Matthews, Joey Boccuzzi, Willy Jaret, Bo Crotta, Corey Peterson, Mim Mucherino and Dr. Bob Neff, DVM. A total of 300 ribbons were made using the Kerckhaert SX-7 horseshoes donated by FPD. All of the ribbons will be sold for $5.00 each at the benefit to be held Saturday, February 23, 2013 from 10:00 a.m. to 4:30 p.m. at the Edmond Town Hall on 45 Main Street in Newtown, CT. Admission is $10.00 per person. 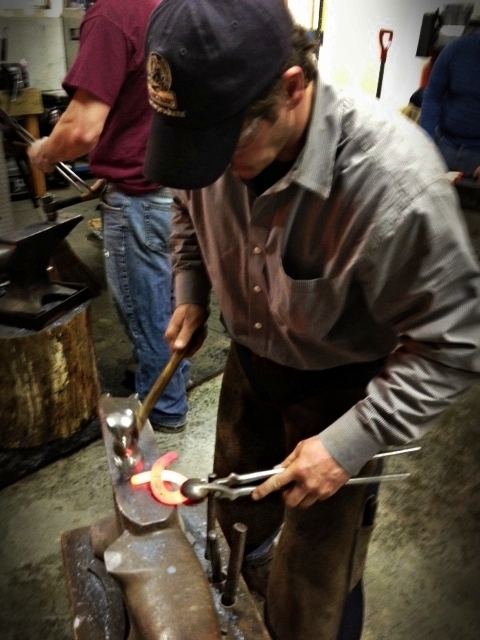 If you are in the area, stop in and support your fellow farriers – and the Newtown community. Everyone at FPD is keeping the Newtown community in our thoughts as they continue to heal after this terrible tragedy. 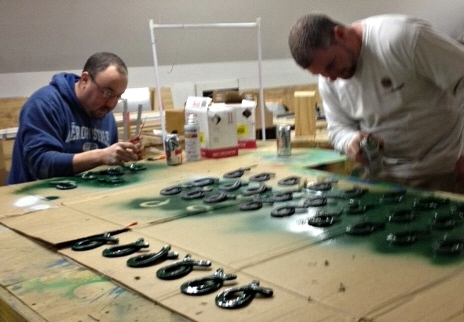 Forging the Sandy Hook memorial ribbons from Kerckhaert horse shoes donated by FPD. Volunteers paint on the finishing touches. 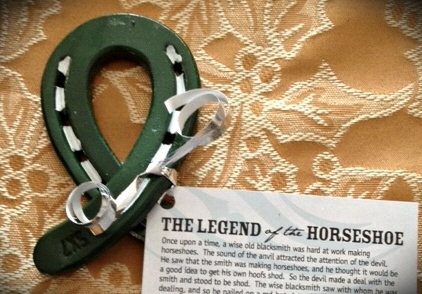 Legend of the Horseshoe tags attached to each horseshoe ribbon. This entry was posted in Events, On the Road, People, Stores and tagged blacksmith, Farrier, good deeds by farriers, horseshoes, kerckhaert, memorial ribbons, philanthropy, sandy hook. Bookmark the permalink. I would love to buy two of these horseshoes but I do not live nearby. Could I send a check and you could mail them to me? I will be happy, of course, to pay for shipping & handling! Thank you. We’ll get some contact information for you or have the organizers contact you. Thanks for visiting the blog. Please let me know & how I would do this with you. Hi Jennifer- we’ll get you a contact number. I think they are planning to make some more of the ribbons. Thanks for your support. That’s a really nice gesture and nice looking horseshoe ribbons too! Thanks for supporting the memorial, these will make nice reminders for all. Hi Keith, This was the idea of a group of farriers in the Newtown area and we are just glad we could help support it.